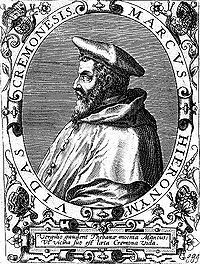 Marcus Hieronymus Vida was renowned as one of the best connoisseurs of Latin of his time. In 1510 he moved to Roma, where he subsequently benefited from the favor and support of three succeeding popes, namely Julius II., Leo X. and Clement VII. In 1532 he was promoted to the bishopric of Alba near Turin. During the years from 1510 to 1527, he composed Scacchia Ludus, his epical poem on chess which he published in 1527 in Rome, jointly with his work De Arte Poetica. 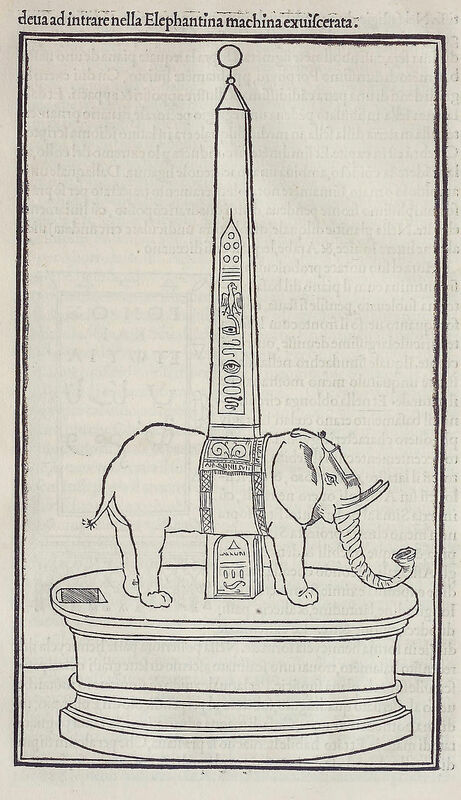 (1) A clandestine print had appeared in Lyon in 1526/1527, prompting Vida to speed up his authorized publication . 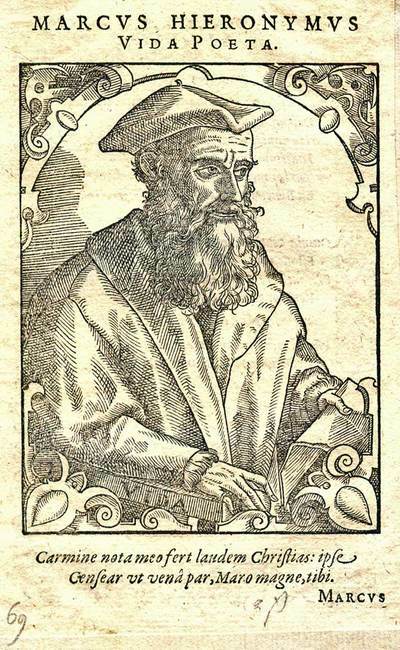 In quick successions , numerous reprints and translations appeared throughout Europe - Scacchia Ludus became one of the major successes of the 16th Century. 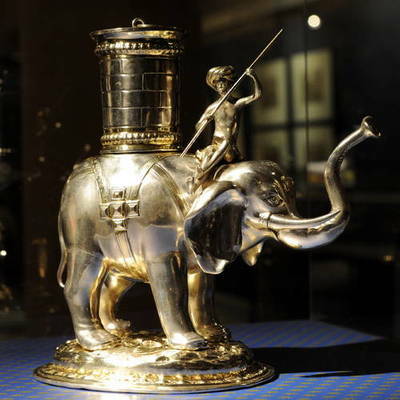 It's importance for the history of chess is obvious, reinforcing the statute of the game. Especially striking is the fact that Vida has the Gods assembled in far Ethiopa for the wedding of Oceanus and Thetis play by the new rules in chess - which had only been around for about two dozen years, replacing the medieval form of chess. 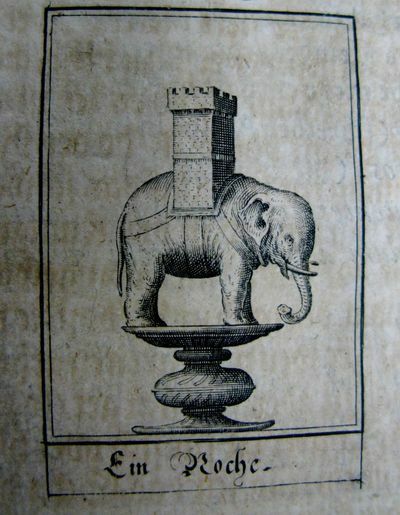 We also owe to Vida the introduction of the tower (=rook) into chess. Chess players are to such degree familiar with this piece hardly any would think of questioning what such a static figure is doing in a dynamic game ! In fact, Vida did not conceive a kind of "static brickpile" , but rather a figure that might serve to describe the turbulent course of a fictive battle. With his first sentence - Ludimus effigiem belli (("we are playing an image of war", ed.) 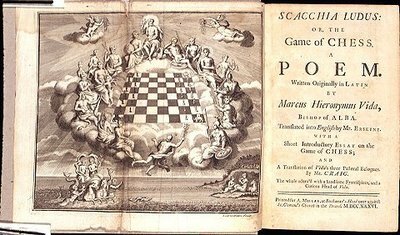 - he makes it clear he sees the chess game between Apollo and Merkur as a picture of war, an imaginary painting of a battle, and the epic is constructed in the pattern of an "ekphrasis" ( =iconic interpretation,ed). This ancient method from Antique Rhetoric of "reading" a painting depended on creating an impression of vivaciousness. All pieces of the chess game had to appear like live actors. 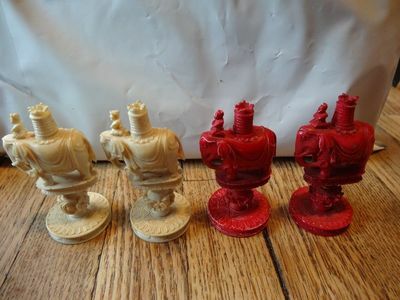 But right on the corner squares he encountered a chess piece, which was totally useless for his battle description. 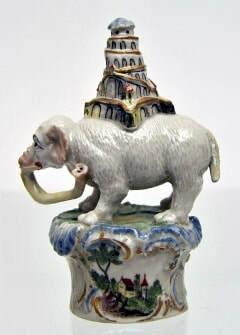 Although this "roch" or "rochen" (which led to the english name "rook", ed) moved exactly like our rook (tower, torre , tour) , by this time the original meaning of this piece in chess was not retained any more. Today we know the word "roch" derives from Ancient Persian and denotes a warrior figure posted at the flank. 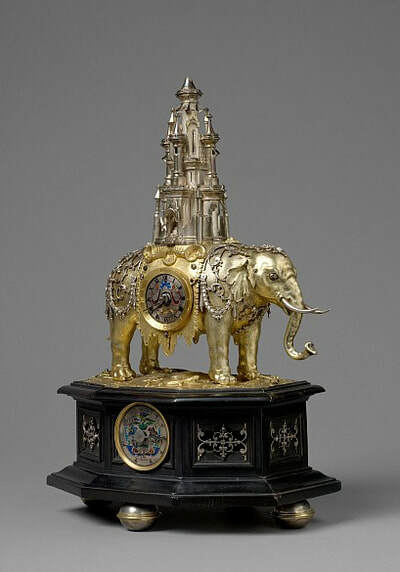 In the late Middle Ages this piece had become a decorative object, a symmetrical structure of bizarre contours, for example of double-headed eagles, crossed halberds or double heads, but lacking any solid pointers for a transformation into a figurative piece. 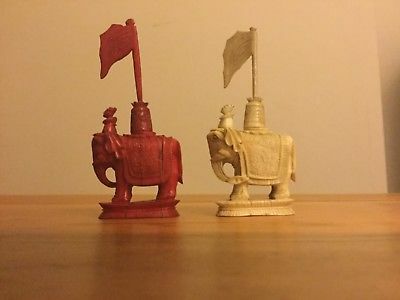 In some figurative chess sets from those days the roch is shown as a guardian or a chariot driver, but never as a tower. 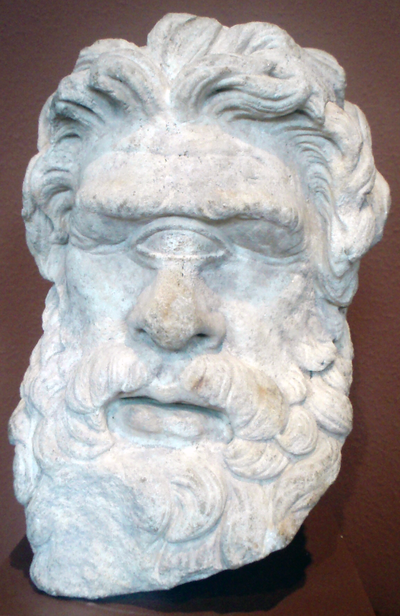 Vida could not work with the "roch", what he needed was a figure acting lively, apt for war - and he at first decided to use the cyclope. It has been assumed - probably correctly - Vida must have been inspired in this choice by the "Castle Guardians" (custodi dell' arce) in the Hypnerotomachia Polyphili by Francesco Colonna (2) - this text, albeit finished in 1469, was published by Aldus Manutius in Venice 1499. (3) At that time the medieval rules of chess were still in use. The "live" chess game described in length in the" love battle in a dream" (meaning of the title,ed) therefore conforms to these rules. 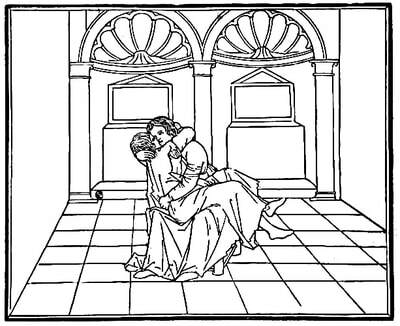 When the book was published, the new rules involving the long moves of queen and bishop were already in use, but the older rules had not yet been forgotten. Colonna's and Vida's "background games" are as different from each other as the old chess rules from the new ones. 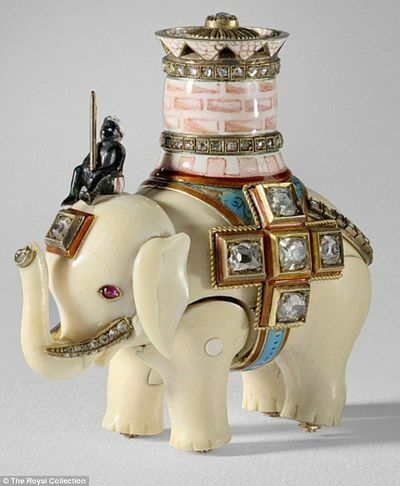 The "old chess" goes well with an artful setting as in a ballet, measured movements, consonance , harmony and symmetry. The protagonists behave like artists, they are dancing, with music accompanying the game. The moves on the game board, a hall floor, correspond not only with the music notes, but also the architecture, the color of the objects and dresses, and the movements of the planets. In the grip of such universal syntony Polyphilus is overcome by delight, and feels as in heaven (the Olympus , ed). Vida's epic is the exact opposite. 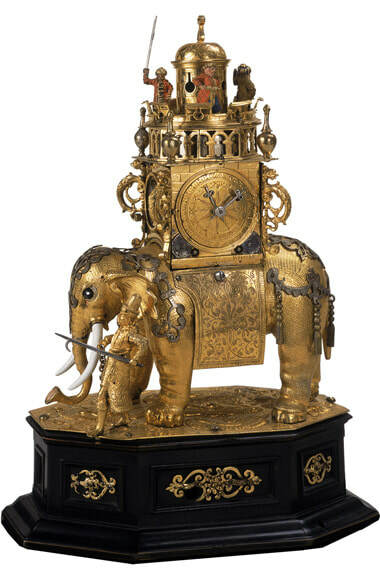 As in the Hypnerotomachia the game is preceded by a banquet, (4) but the following game is a fight between two gods, a tournament , almost a duel, and it is not a ballet that passes on the board. No sign of music, nor of harmony! - it's a bloody battle! The slain fighters are not bid farewell with a kiss, they are mourned and taken away. Fury and horror, daring and desperation take hold of the remaining actors. But Vida's game is also "live chess" - he describes how the figures "in boxwood" come alive as soon as put on the board, and how anxious they are to begin the battle. As contrary as the ideas on chess were with Colonna and Vida, they did have one problem in common. They needed live actors, to attribute certain functions to. Colonna substituted "Custodi" for the rochs. Vida at first opted for cyclopes, since allusions to Classical Mythology were important for him. 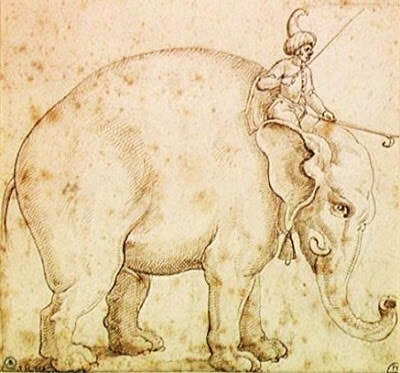 The cyclopes were appropriate because of their immense power and fighting strength - but was it only because of these the qualities that Vida in the end chose elephants instead of cyclopes? It cannot have been the Arab tradition to influence this option - here the elephant stands for the bishop - nor the later Indian usage where the kings and his counsellers are riding on elephants. An elephant also crops up in the Hypnerotomachia , but has nothing to do with the game of chess. 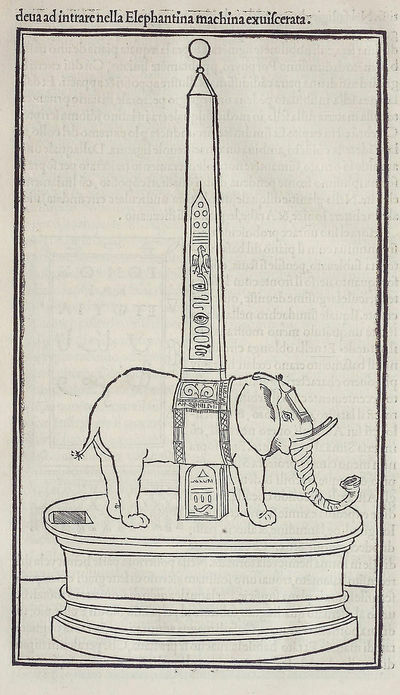 He carries an obelisk - a a monument which represents the four wind directions as well as the sagacity of Ancient Egypt. 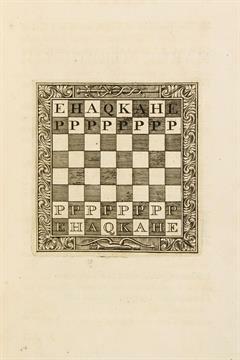 This might have appealed to Vida, and his allegory-motivated imagination, since he was familiar with the meaning of chess as the square of the world. 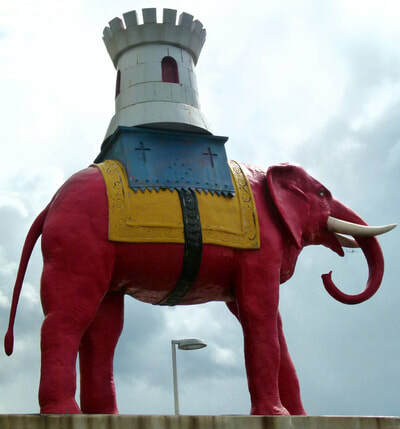 But it is not likely this monument of of mysterious ancient wisdom led him to the chess elephant. 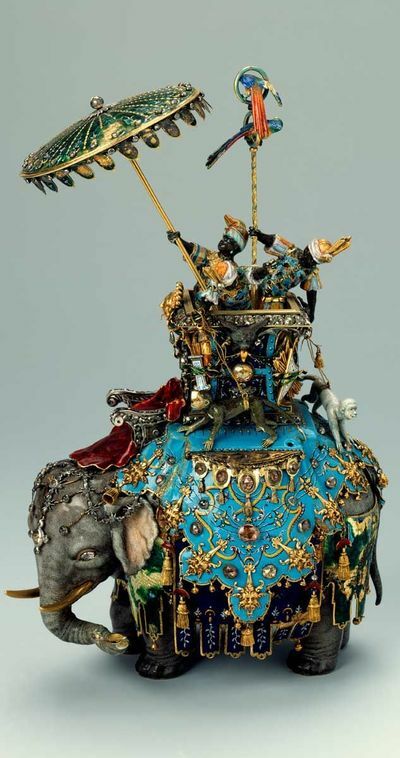 Even less likely that the infrequent pictures of war elephants with a tower on their back might have inspired him - this was general knowledge. 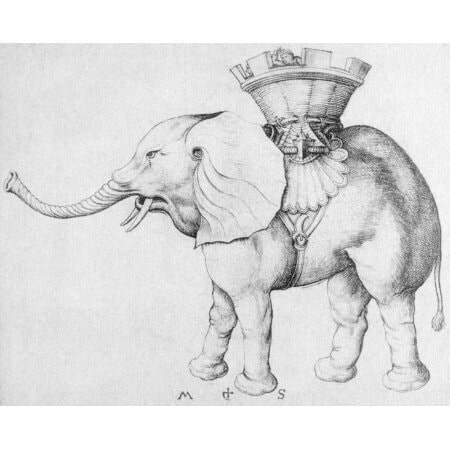 Nobody had connected war elephants with chess before Vida. Some editions of Livius, the romance of the Maccabees or the novel of Alexander featured war elephants. Elephants also appear in other medieval art as "Mirabilia" from distant lands. 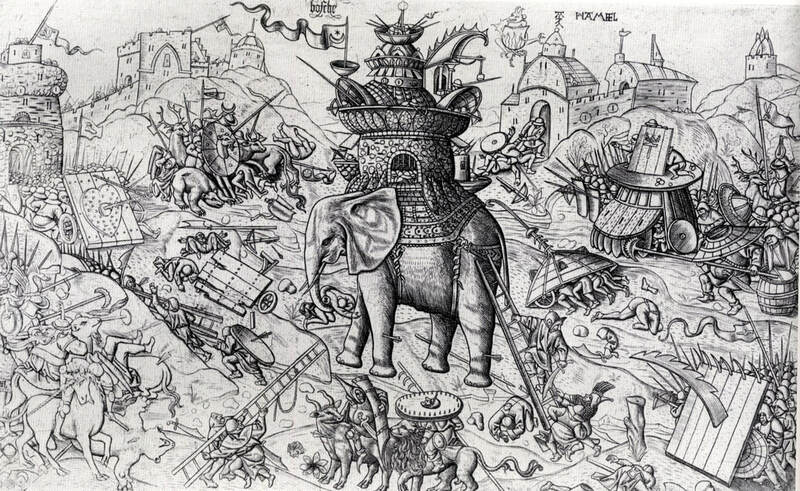 A well known print by Martin Schongauer depicts such a massive war elephant, and in an etching of Alaert du Hameel , printed in various versions, (5) a war elephant is seen in the midst of a battle against monsters and scoundrels in the style of Hieronymus Bosch, with whom du Hameel was acquainted , possibly a friend. 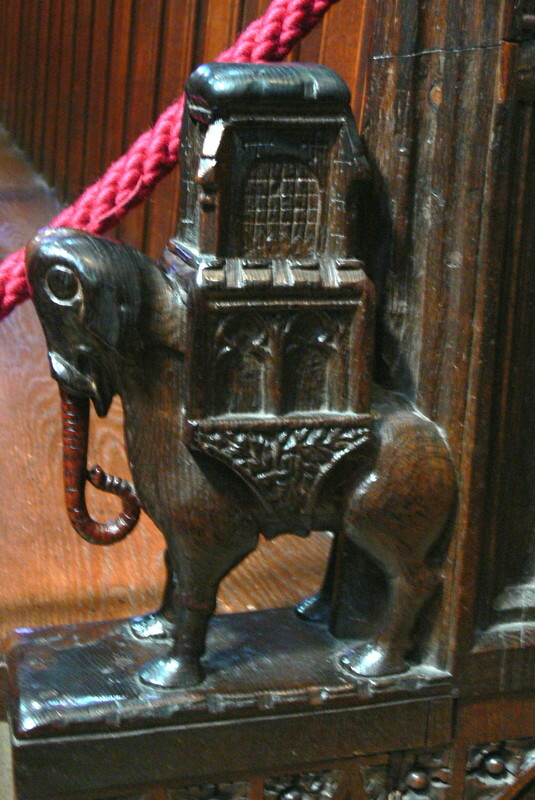 Therefore, a repertory of turret-bearing elephants in picture and text did exist, and could be taken into account. The question arises how this trend or fad entered into chess. By the way, the great elephant boom, that wondrous proliferation of allegorical pachyderms in literature and art, only really got going after Vida's Scacchia Ludus, after its publication in 1527. Very rarely new combinations are due to philological knowledge or erudite reading. In most cases, it is through astonishing new experiences that such background ideas pass from the static to the dynamic stage. 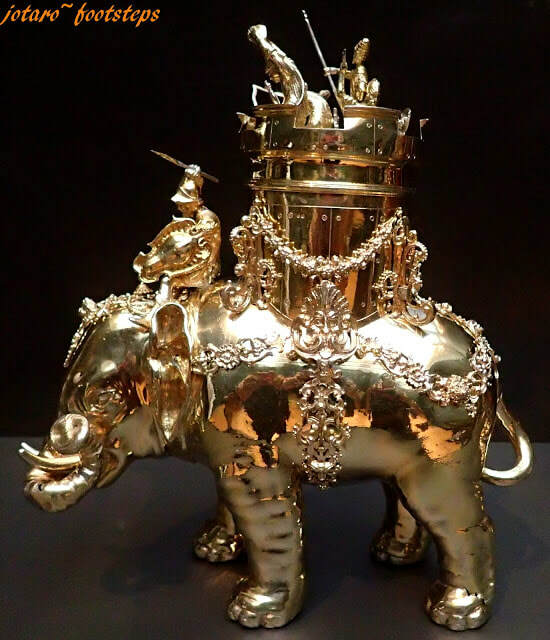 What "revived the glowing embers" , confirming his readings and inspired a new idea for Vida, must have happened in Rome - that is, the Rome of Pope Leo X. , a potentate with a liking for chess, who set Vida's career on the rails. Leo was crowned as Pope in 1513. Envoys from many countries made their way to Rome to pay homage to the new head of Christianity. The Portuguese delegation outdid themselves with lavish presents - among other treasures they brought an enormous indian elephant along, ! Portugal then was one of the most affluent countries in Europe thanks to their overseas dominions. 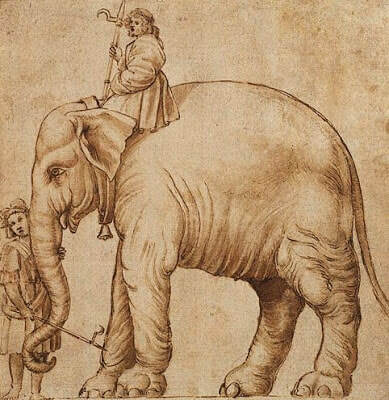 Hanno, the elephant , definitely was the "weightiest" of all presents, the pope not only was highly impressed, but immediately took a liking to his new pet. He made sure Hanno was provided with a suitable stable, personnel and the necessary care - Hanno was an important personality. Raffael drew a portrait of him, which unfortunately has been lost, but we do have copies by other artists. 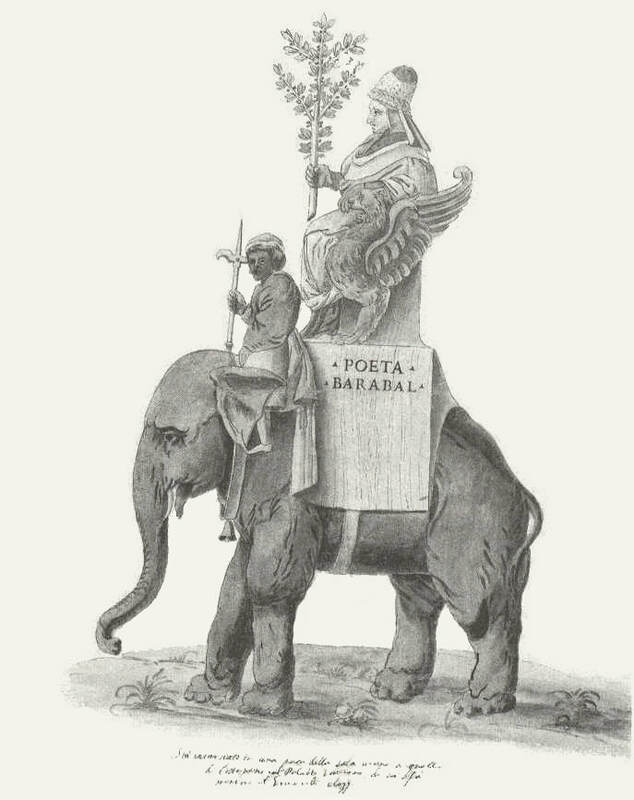 In processions, Hanno carried a tower on his back. During one of these processions Hanno suffered a mortal accident - scared by mortar shots he galloped off, and with tower and all fell into the river Tiber. But according to another version his body was gilded all over for one ceremony, blocking the respiration of his skin - even elephants will not suffer such treatment. 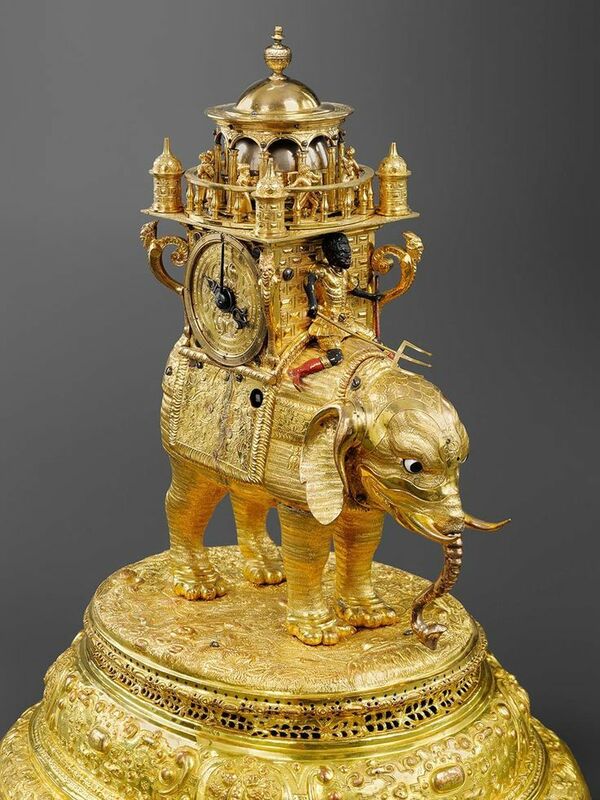 This version , though, reminds us of the later transformations of elephants into golden and silver artworks in the Sovereigns Collections of wonders of Art and Nature (Kunst- und Wunderkammern) . 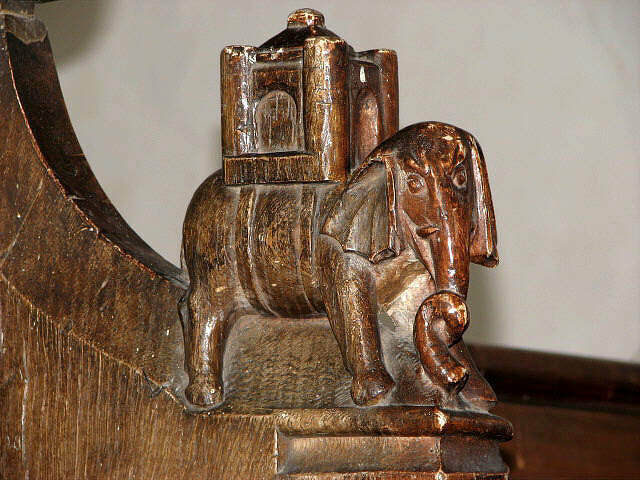 Of course it would be quite wrong to attribute the rather remarkable multiplication of tower-carrying elephants or war elephants in the 16. Century solely to Vida's Scacchia Ludus . But he is bound to have his part in this iconographic oddity - many people had read his short epic, and quite a lot were persons interested in all kinds of allegoric games and combinations. Vida must be considered one of the potential crossing points of several idea strains, since he clearly and intentionally created this literary-playful traffic point. from then on, these paths branch away and separate. 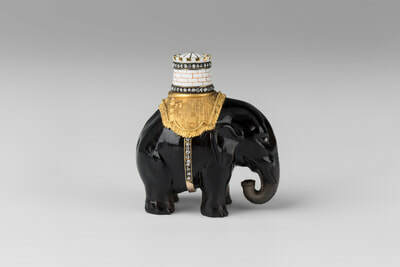 But the proliferation and growing importance of elephants will continue to grow. Book successes of those times are mostly forgotten nowadays, but in their days they were among the things one had to know, and which one could make sense of. Strangely enough, Erwin Panofsky - usually very aware of literary founts - did not notice Vida's influence in his discussion of the Gallery in Fontainebleau Palace. 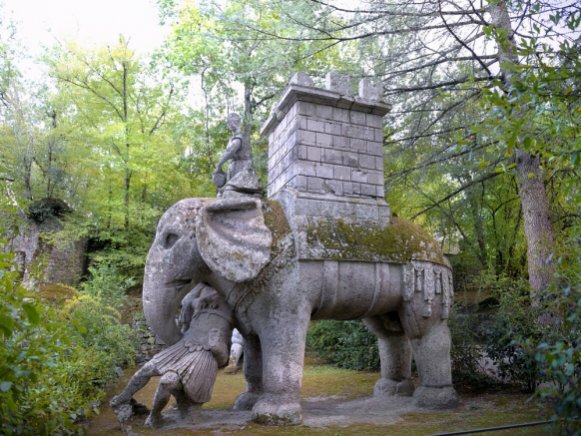 (8) And just maybe the tower-burdened elephant in the Park of Monsters at Bomarzo has something to do with the genealogy of the chess elephant started by Vida. It should also have been easy to mention Vida in the massive work on the park in Bomarzo, by Horst Bredekamp. 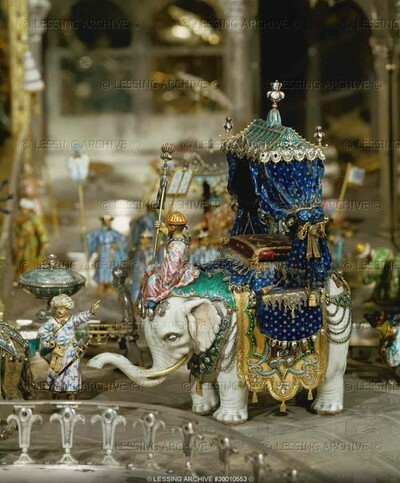 (9) A huge elephant , almost collapsing under a mass of decorative ornaments, may be espied in the impressive book on architecture by Wendel Dietterlin - one of the many architectonical mindgames of this master that might merit a profound analysis. 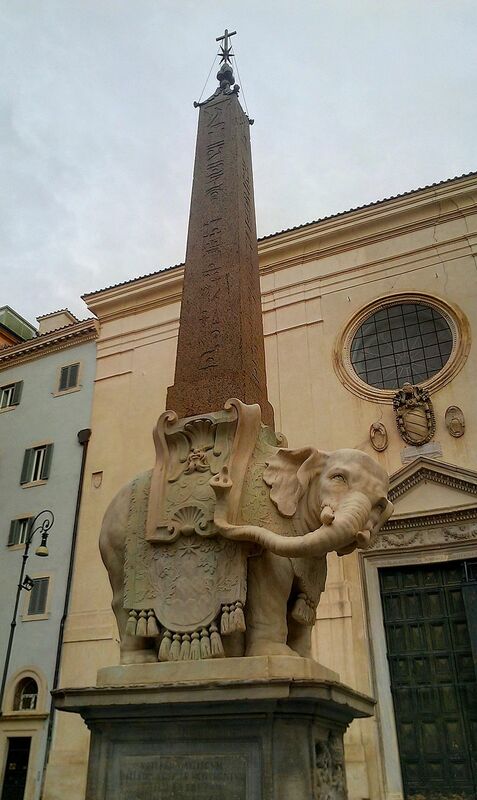 Bernini saw an elephant in Rome in 1630 and inspired by the Hypnerotomachia, in his drawing of the beast put an obelisk onto its back! 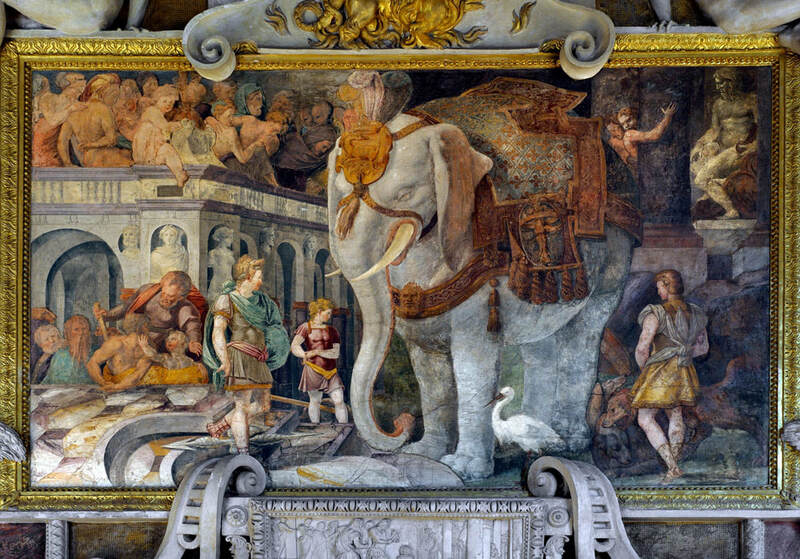 His drawing only was realized as the famous elephant on the Piazza S.Maria della Minerva 30 years later - Pope Alexander VII. must have thought the idea attractive. Once again, a pope, the Hypnerotomachia and an elephant were involved in the "game". 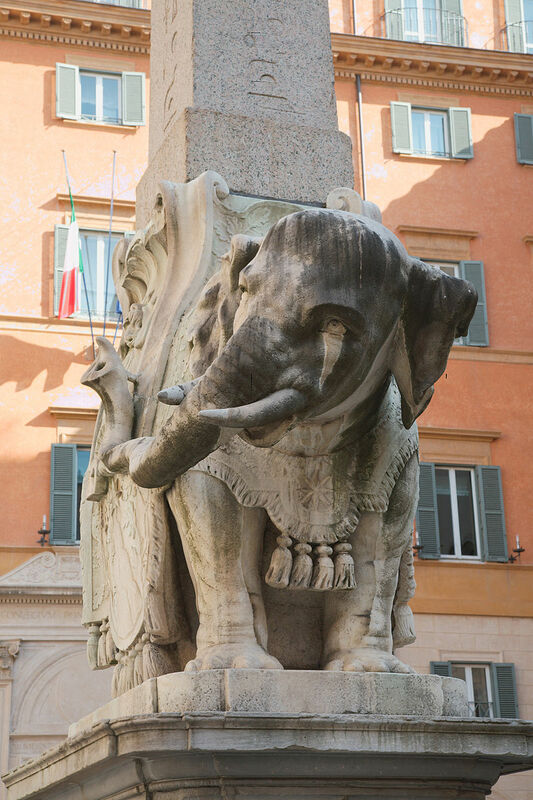 Heckscher even mentions the fact of an elephant appearing in Rome for the first time in hundred years, which impressed Bernini with its plastic and colossal qualities. The earlier specimen - Hanno - must have exercised a similar fascination on Vida in 1513. And like Bernini, Vida needed many years until he could utilize this impression in an artistic way - for both of them, the result was quite convincing, and generated multiple sequels. 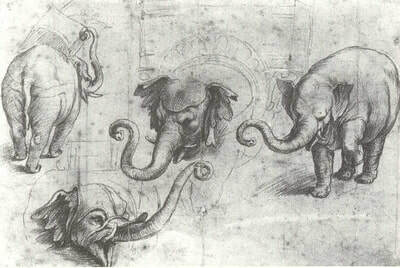 This parallelism may pass as footnote or a minor point - but since the components of these "inventions" all match (the Hypnerotomachia, a Pope full of ideas and an "authentic living elephant"), the conclusion of a possible connection between these two sequences of facts a hundred years apart might be considered as not all that far out. With all necessary care, one might condense it as follows: in both cases, equal and similar elements of the combination are apparent, just the iconic tradition was not the same. For Vida, this tradition was rather sparse, for Vida is was highly varied, fully developed and close to the end. Bernini closes the book for this story. 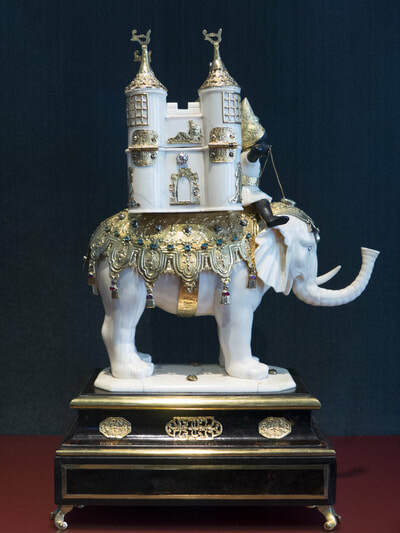 If chinese chess sets produced for the European market from the 18th century on regularly sported elephants with towers as rooks, this cannot be explained simply as picking up an European patterns and reproducing it for export. What seems to have taken place, is a selection - a rarity in Europe turned into a rule in China. Chinese crafts shops often used books with illustration imported from Europe, with Jesuits and merchants as the principal intermediaries. 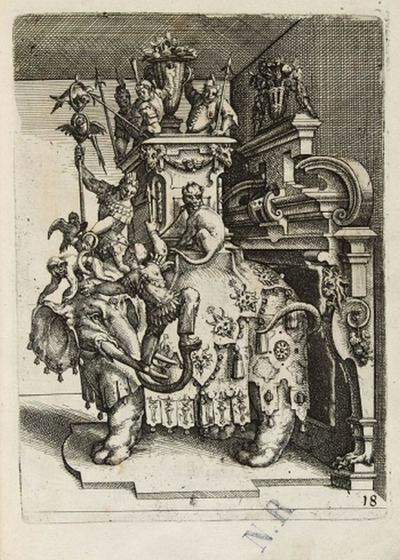 One of the books showing how chess pieces looked in Europe must have been the chess book of Duke August of Brunswick-Luneburg, aka Gustav Selenus, which was published in 1616 with the title "Das Schach -oder Königssspiel". In this case, the chess elephant of Selenus would have been the prototype of the chinese chess elephant, and the chinese elephant for Europe originated in Europe! 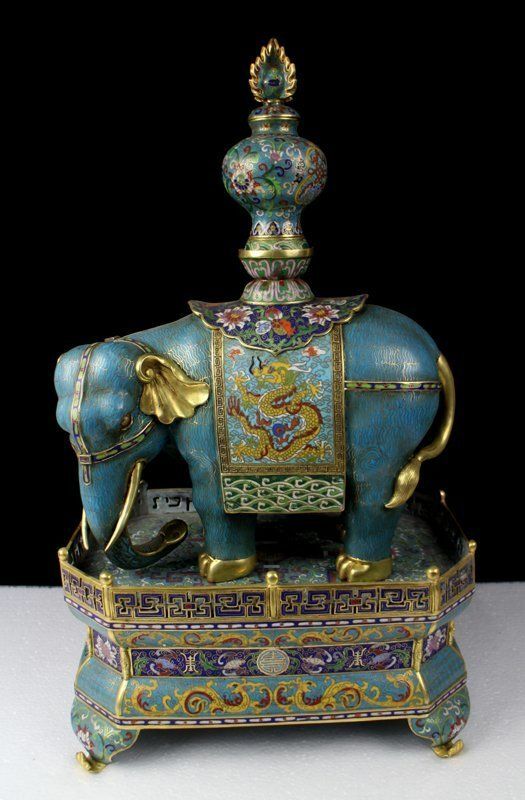 On the other hand, the chinese ivory turners and carvers were not unfamiliar with the elephant in chess, as this is the designation of one of the pieces in chiangchi, the chinese chess version. But the word in the chinese language does not have any reference to a tower! 1) for Vida see. : Mario A. di Cesare, Biblioteca Vidiana, A Bibliography of Mario Girolamo Vida, Florence 1974; Mario di Cesare, The Game of Chess; Marco Girolamo Vida’ s Scacchia Ludus; with English Verse Translation and the Texts of Three Earlier Versions, Nieukoop 1975; Walther Ludwig (ed. 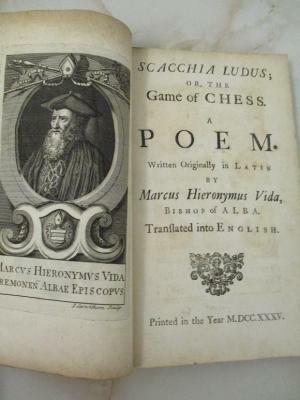 ), Marcus Hieronymus Vida, Schachspiel der Götter, Scacchia Ludus. Mit der Übersetzung von Johann Joseph Ignatius Hoffmann, Zürich und München, 1979; Jacques Chomarat, Les Échecs d’ après Vida, in: Philippe Ariès et Jean-Claude Margolin (Hrsg. 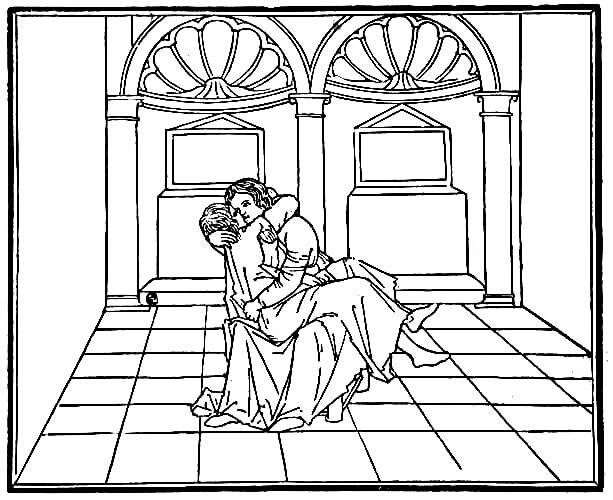 ), Les Jeux à la Renaissance. Actes du XXIIIe colloqui international d’ études humanistes, Tours, Juillet 1980, Paris 1982; Mario di Cesare, The Scacchia Ludus of Marco Girolamo Vida, The Didactic Poem as Fictional Text, in: Stella P. Revard, Fidel Rädle, Mario di Cesare (Hrsg. ), Acta Conventus Neo-Latini Guelpherbytani, Binghampton, New York 1988; Reinhold F. Glei, Thomas Paulsen, “und sie spielt sich doch!” Zur Rekonstruierbarkeit der Schachpartie in Vidas ‘Scacchia Ludus’, in: Neulateinisches Jahrbuch – Journal of Neo-Latin Language and Literature 1, 1999, S. 65-97. 3) on the chess game in the in der Hypnerotomachia Polifili see. : Barbara Holländer, Lebendes Schach in der Literatur des 16. und 17. Jahrhunderts, in: Homo Ludens IV, München/Salzburg 1994, S. 125-135. 4) compare Edgar Wind, who analyzes most succinctly as well as extensively in relation to Bellini's "Feast fo the Gods" (Nat. Gallery Washington, 1514) what the meetings of the ancient Gods "for a dinner" might have meant in Northern Italy around 1500: Edgar Wind, Bellini’ s Feast of the Gods, Cambridge (Mass. ), 1948. 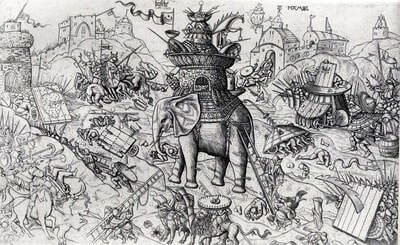 5) about this etching: Gerd Unverfehrt, Hieronymus Bosch, Die Rezeption seiner Kunst im frühen 16. Jahrhundert, Berlin 1980, S. 241, Kat.Nr. 6. 7) cited acc. 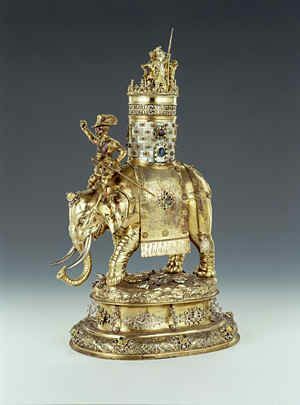 to the edition of Walther Ludwig (Anm. 1), S. 27. 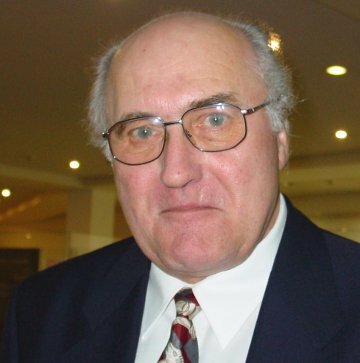 Hans Holländer, renowned art historian, stalwart of CCI and one of the most important chess historians of our time, passed away a bit over a year on April 28. His many fascinating essays and contributions on the apparent and hidden connections between chess, art and life have been published in the most diverse magazines, essay collections and other media. This text was published for the first time in the "Festschrift" for the 65st birthday of Götz Pochat, Grazer Editionen, vol.2, in 2007.